The Alps in winter are magical and beautiful, the mountains and the forests transformed by the blanket of white. Why not come out and discover this beautiful world and give yourself a break from winter at home? 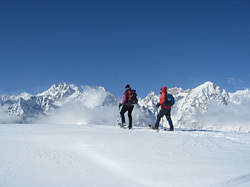 Snowshoeing has become incredibly popular in the last ten years, although its history goes back many centuries. Although not as mainstream an activity as skiing, any fine winter day between December and April will see people setting off into the hills on snowshoes. Snowshoers do not rely on lifts so they can go into the mountains where there are no ski pistes, no noisy grooming machines, no crowds waiting in line. This is the real mountains in winter, for those who love the peace and tranquility found in the hills. 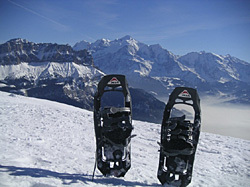 I offer snowshoeing holidays throughout the winter from January to April. We snowshoe throughout the FrenchAlps (including some lesser-known regions), and also in the Italian Aosta Valley, and the Swiss region of Les Diablerets. 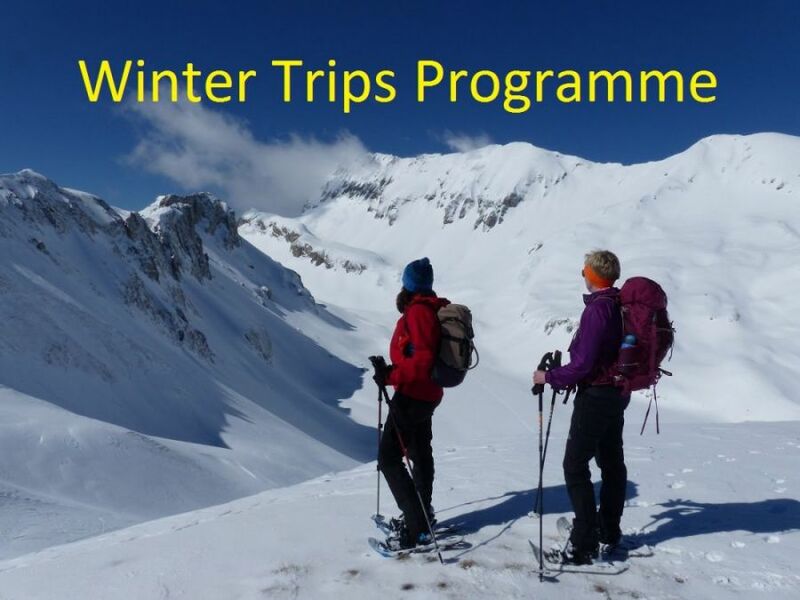 We’ll do day walks from a hotel base and maybe 1 or 2 overnights in mountain accommodation, our itineraries being governed by snow conditions and the grade of the holiday. We’ll climb up through snow shrouded forests to emerge on the high sunny slopes with wonderful views of neighboring peaks. Wildlife abound, their tracks in the snow telling us the story of their nocturnal activities. Often we’ll make our objective a high pass or even a mountain summit, exploring the best of the mountains in winter far from the crowds. I wrote the main English book to snowshoeing. This book is the result of my many years of snowshoeing in the Alps and usually when you snowshoe with me in the Mont Blanc or Aosta Valley Regions we will do some of the walks and summits in this book, as well as others that I have kept secret! Snowshoes are basically a larger base that you attach to your shoes to make the surface area of your foot bigger, thus enabling you to walk in deep snow without sinking in as much as you would otherwise. People have used such devices to travel in snow since records began, both in Europe and North America and Canada. After five minutes you hardly notice you're wearing snowshoes, they are so easy to walk in. There is no similarity with skiing - this is walking not sliding. We use poles and we’ll be equipped with avalanche beacons, shovels and probes. This safety gear means we can travel safely in the snowy mountains. We’ll spend time practicing how to use the equipment, and I will also teach you about snow stability and how to assess the dangers. There are many commonly asked questions about snowshoeing - by clicking on this link, a separate window will open with the answers to some of these. A snowshoe holiday allows you to walk in the winter, which is a great boost to fitness at a time when any hiking you do will probably be in the grey gloom of winter. Even just a long weekend will give you a welcome dose of sunshine and marvelous views - many people say that being away for 4 days feels like they've been away much longer, because it is so wonderful to enjoy the sun and the cold crisp air of the Alps. I can be hired by individuals or groups for a private snowshoeing. A private booking means you can come when you want and do what you want at your own level. I can arrange private guiding for the length of time that you want: from one day to a week. This can be guided walks or you can also include a certain amount of instruction, from winter navigation to avalanche awareness. In addition to walking uphill here’s what we sometimes do - it is optional but great fun! !